Harry Potter and the Order of the Phoenix is the fifth movie in the series of seven and is the first movie that I’ve enjoyed more then the book. 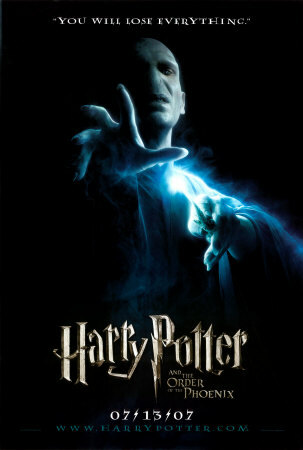 The difficulty that has developed in creating these movies is that as the series progresses J. K. Rowling’s books have become substantially larger. The director has to decide what to keep in the movie and what to remove. David Yates has successfully removed a lot of the whining Harry did in the book that really slowed down the story and made Harry rather annoying. In this movie Harry finds himself isolated all summer long. He has not heard from his friends Ron and Hermione or Professor Dumbledore after ending the last school year facing Lord Voldemort and bringing Cedric Diggory’s dead body back to the school. Once Harry returns to school he finds out that the Ministry of Magic has been posting articles in the Daily Prophet saying that Potter is lying about Voldemort being back and that Cedric’s death was a tragic accident. Harry’s classmates believe what they’ve read in the paper and shun Harry for trying to spread fear just to get attention. Harry feels even more isolated then when he was with the Dursley’s in the summer. Here is where the movie is a huge improvement over the book. Harry’s friends and classmates quickly rally around him to let Harry know he is not in this alone. Harry becomes a leader in this movie and you can see he is finally evolving into the hero that has been hinted at since the beginning of the series. In the other movies Harry has somewhat stumbled his way to defeating Voldemort and his followers. In this movie you see a more mature and confident Potter. He knows what he wants to do and is aware of his developing powers. There is a fantastic battle in the Ministry of Magic which is more intense and has more impressive special effects then in any of the previous films. If you get a chance to see this in an Imax 3D theatre then do so. If you haven’t seen any of the other films or read any of the books this is a good place to start. The Order of the Phoenix is the beginning of the end. Tension will build through the next two movies to an expected climax where Harry will be face to face with Lord Voldemort and only one will survive. Of course we won’t know for sure until the final book is release this weekend July 21. I have my copy of Harry Potter and the Deathly Hallows pre-ordered and I’ll be writing a review shortly after. Make sure you don’t miss out on the most successful series of books and movies or our time!